When you think of grilling, you probably picture summertime barbecues and pool parties. And while grilling is a great way to entertain during the summer months, there’s no reason for you to pack away your grill when you pack away your shorts and t-shirts for the season. The truth is… food cooked over an open fire just tastes better. And good food is worth the slight inconvenience of grilling during the colder months. So whether you’re preparing the perfect tailgate snack or a holiday feast, it’s time to bundle up this winter and start the grill. A common strategy for winter grilling is to work with cuts of meat that cook hot and fast like burgers or thinner steaks and chops to reduce the time spent outdoors. If you’re new to grilling during a cold snap, you may want to start with these juicy burgers or a classic NY strip with herb butter. Both cook pretty fast and you’ll beat the cold. While I see the appeal of spending less time outside—-I just dress in layers and head out! I tend to do cuts of meat that I can incorporate into more traditional cold weather comfort foods. For example, I love to smoke beef chuck roast and incorporate that into stew or chili. I also like to smoke whole chickens for my chicken and dumplings. For even more flavor, consider placing the entire pot (dutch oven or other oven safe pot) of chicken and dumplings on the smoker for about 20 minutes before serving, the dumplings will really take on some smoke. Despite it not feeling as inviting outside, there are some foods that are easier to smoke in the winter using cold smoking. Foods like butter or cheese are nearly impossible to smoke in the summer months due to the higher outside temperatures; winter time however, is great for these foods. If you’re a seafood lover, my friend Joe created an incredible recipe for cold smoked salmon. 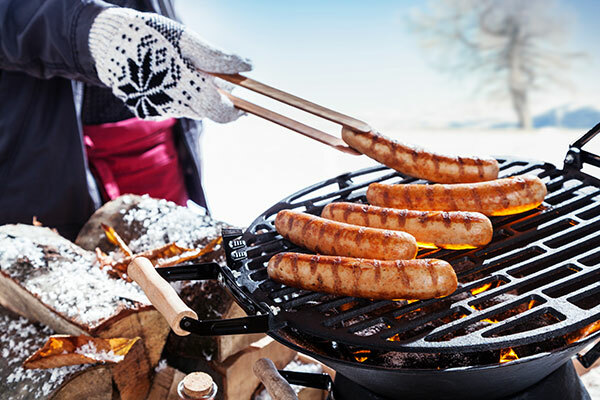 Cold weather grilling is also a great way to celebrate the holidays. I love smoking a prime rib for holiday meals because it’s a showstopper that is sure to please! Beyond your fingers getting cold, there are a few challenges to cooking when the weather turns cool. It’s harder to maintain a consistent cooking chamber temperature, depending on the cooker you’re using. A basic metal grill will pose a challenge for most grillers since the cooker has little insulation and chilly winds can compound the problem of temperature fluctuation. When I use a metal smoker in winter, I wrap it in standard home insulation to combat the elements. Don’t feel like taking a trip to Home Depot? Some higher-end cookers, such as Yoder pellet cookers, offer custom-fitted winter blankets for cold weather operations. If you’re planning on grilling this winter, you may also want to consider a ceramic cooker since the superior insulating properties of ceramic help retain heat and keep the temp consistent. Another challenge for cold weather grillers is light. It gets dark early during the winter months, so having a reliable grill light is an excellent idea. I’ve tried a few outdoor lights, some of which didn’t work for me. I currently favor the Outset Grill LED light, which is affordable and dependable in any season. One final challenge comes after the cooking is done: meat may not be able to properly rest in the winter, as it can cool too quickly. To combat this problem, preheat ceramic or cast iron pans to use as holding dishes. This will allow your meat to rest without losing its temperature too quickly. Grillers should always be vigilant before starting their cooks, but there are several added safety concerns that come with cooking in cold weather. Don’t think you can outsmart the weather by moving your grill to the garage. Grilling in an enclosed space is dangerous due to increased smoke inhalation and the risk posed by stray embers. As much as I love to grill, I’m not going to risk burning my house down to do it. Gas grill hoses should always be inspected before use, but this is even more important in freezing temperatures. Older hoses may crack in extreme cold, causing leaks in the line. Before you cook, I recommend pouring a soapy water solution over the hose and looking for any bubbles that would denote a leak. After cooking, be sure to close the propane valve completely. Always carefully inspect the area around your cooker. Be sure your grill is free of leaves and twigs that may have been blown onto the cooker from nearby trees. Slips and falls can be avoided by clearing your path to and from the grill of any snow and ice. Finally, dress smartly before you cook. I don’t recommend wearing scarves or loose clothing that may inadvertently ignite when near flames. It always pays to be prepared. Get everything ready before you brave the elements. Have what you’ll need near the door and pre-staged. This keeps things warm in the house and avoids the need for you to track snow, ice, and water through the kitchen because you forgot to grab the salt. It will also minimize the time you spend outside! Invest in a good grill cover if you don’t have one. Covers are inexpensive and lend longevity to grills. They also make it much easier to start your winter cooks—-especially when there’s snow on the ground. Be prepared to use some extra charcoal in the cold weather. When outside temperatures drop you’ll need more fuel to get your grill to the same temperatures that you achieved in the summer months. Don’t open the grill too often. It may be tempting to watch your meat cook, but opening the lid in winter months can drastically affect the temperature of your grill, and it takes much longer for the cooking chamber temperature to recover than it does in the summer. You’ll also need to be more patient in the cold—-meats can take a bit longer to cook in outdoor temperatures. With a little preparation, there’s no reason that grilling can’t be a year-round option. But, if you decide that winter grilling is too much of a challenge, come back next week for my post on the proper ways to clean and store your grilling equipment so you and your favorite cooker can stay warm and cozy during the holidays. And be on the lookout for some advice on how to adapt my favorite grill recipes to indoor cooking.